Casseroles, Boxcutters, Teaspoons, Jigger, Shaker Classic/Boston, Citrus Juicer, Strainer, Saucers, Martini Glass, Cup. 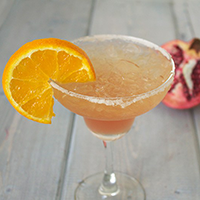 Pour all of your ingredients in a shaker, shake for 20 seconds and pour over ice in a salt rimmed margarita glass. Garnish with a sliced orange and enjoy! Add the pom seeds, sugar and water to a small saucepan on med-low heat to dissolve sugar and express the juices from the seeds. To express the most amount of juice try using a muddler it works great for smashing the seeds. Once you see the sugar dissolve and the syrup getting darker in color remove from the heat. Let sit about 15- 20 minutes to cool and infuse more of the flavors.